If there's a dish that tastes like fall, it's this one! Pork and apples are a great combination and in this recipe, pork is braised for hours in apple cider. Probably what I like best about this recipe is that its a perfect crockpot recipe! Arrange onions and apples on the bottom of the slow cooker. 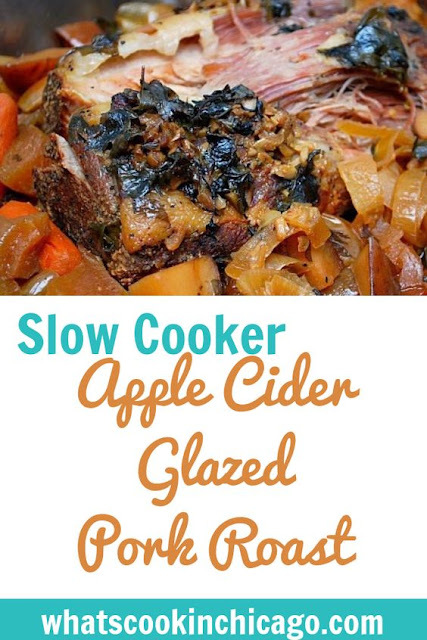 Rub pork roast with salt and pepper and place in the slow cooker on top of the onions and apples. Place carrots and potatoes around roast. Sprinkle the roast with garlic and herbs. Combine the cider, vinegar, ginger and brown sugar and pour alongside the roast. What would you think about using cinnamon in place of the other spices, would it work? I love cinnamon chicken but have never tried it with pork. OTA Mom - I don't think I've ever tried it with pork but if you do, please report back with the results!